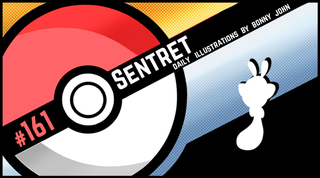 Sentret Says Stop! Pokemon One a Day, Series 2! STOP! In the name of LOVE! Or other things! Today on One a Day is the raccoony furrety something or another called Sentret! What is this thing exactly?! I dunno...But it's kinda cute when it's all mad and being protective. Sentret's always on the watch, and I see him as a vigilant guard who maybe doesn't have the right air to order threats like "stop or else..." but I wanted this guy to be the sorta hero that might one day save his village of furry friends and family with his unrelenting gaze. His determination inspires the young Sentrets to follow in his footsteps. Visually, the style is very angular and cut. The reason why starts with his circular marking. Yes, it's not circular anymore! I realized while I was exploring the subject that by going angular, I could create a living stop sign. The octagonal shape of a stop sign is familiar to us all and for a Pokemon who is scouting and acting like a stop sign in a way, the connection to me was perfect. You're sleeping in the middle of the forest and your Sentret is scouting about to keep you protected. Suddenly, it begins to chirp to get your attention. 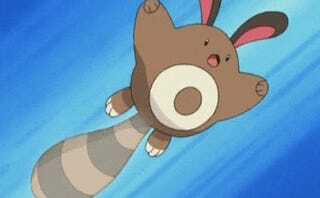 You see it's your crazy ex boyfriend/girlfriend that has set off the alarm of your Sentret! What are they there to confront you about?